FULL DESCRIPTION A wonderful and spacious four bedroom detached family home situated in the ever popular village of Otterbourne. The property is ideally located just a short distance from Winchester city centre, Southampton and Eastleigh as well as the M3 and M27 commuter links. Greenacres Drive itself is a highly desirable residential development close to local amenities including a recreation ground, convenience store, public houses, bus stops and falls within the catchment area of the highly regarded Otterbourne CE Primary School and Thornden Secondary School. The well proportioned accommodation comprises on the ground floor: Entrance hall, living room, dining room, office, kitchen and cloakroom. 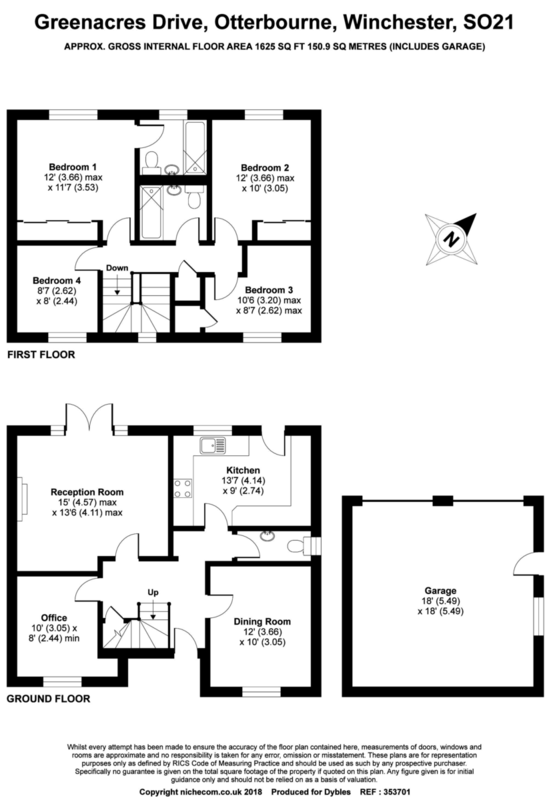 First floor: Master bedroom with built in wardrobes and en-suite shower room, two further double bedrooms with built in wardrobes, fourth single bedroom and a family bathroom with shower over the bath. The property also benefits from double glazing and gas fired central heating. Externally there is a private, low maintenance rear garden with large patio area, a double garage and driveway parking for two/three vehicles. No onward chain.